So my big girl dropped her first tooth a few weeks ago and it was definitely a milestone to remember. I was pretty amazed that there was not a single drop of blood and she said there wasn't any pain in the slightest too. Woohoo! 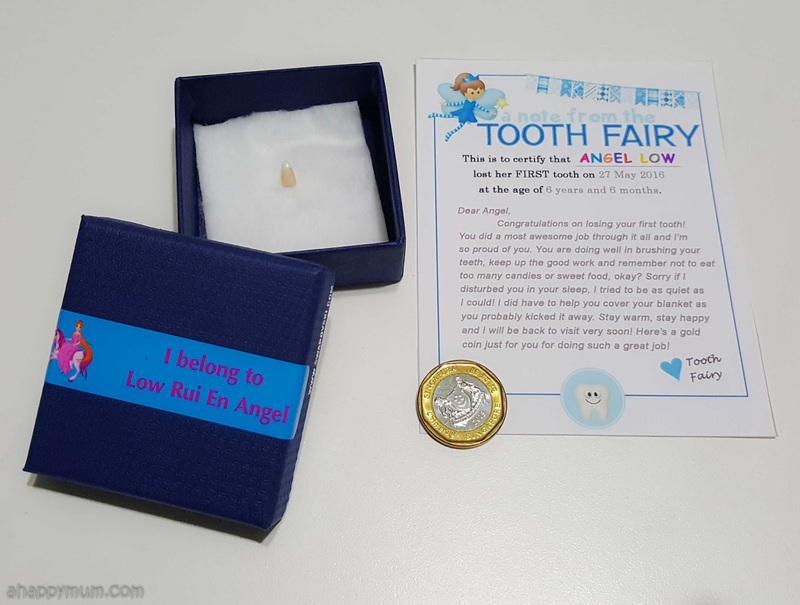 Anyway, the Tooth Fairy came to visit her (yes, she did) and my girl was totally over the moon because she had read so much and heard so much about this mysterious, beautiful fairy. She received a personalised note, a gold coin and you know what? 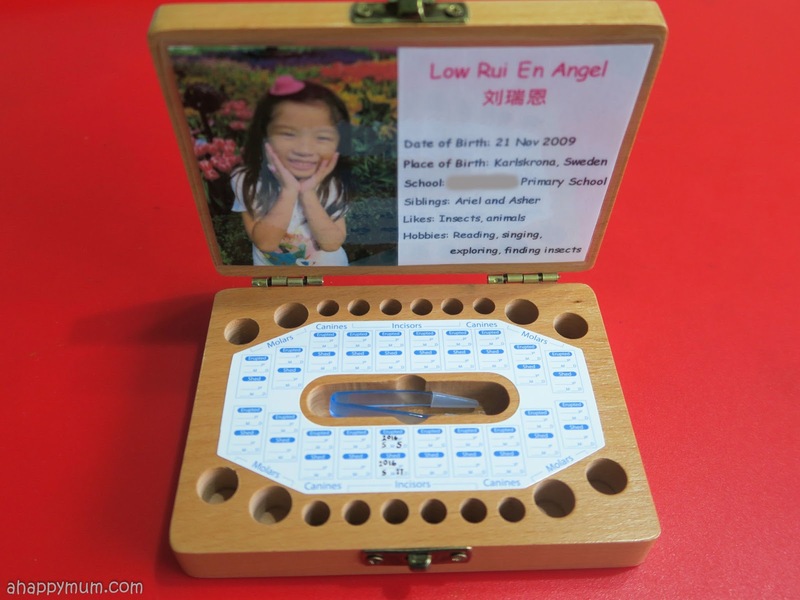 She wrote back to the Tooth Fairy to request for her tooth back so that she could keep in her tooth box. 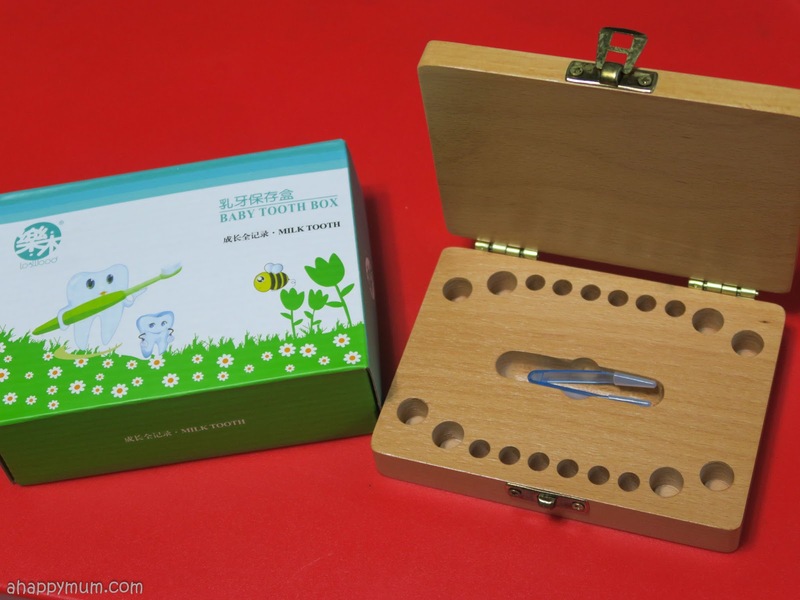 Yes, you read right, a Tooth Box. I bought this lovely wooden tooth box online after seeing my friend from Miracule getting it for her son too and it's pretty awesome! 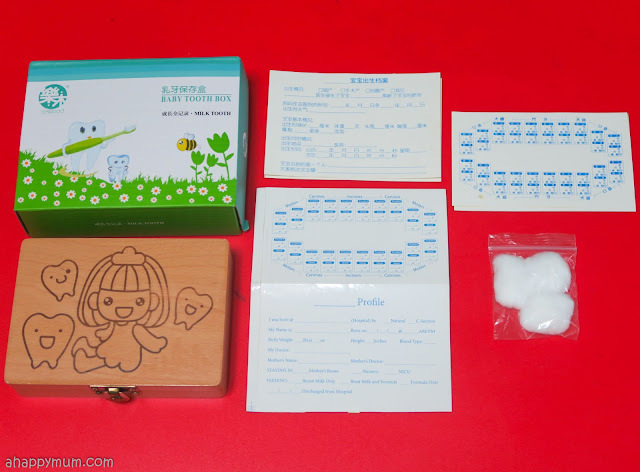 Not only does the wooden box come with a cute design on the cover, it also comes with stickers (in English and Chinese) that allows your child to learn the names of the teeth and even record the date that they sprouted and dropped. How cool, right? You also get a cute little pair of tweezers to handle the teeth and there are even cotton balls inside in case you ever need them. There is also a profile sticker that lets you fill in your child's particulars if you want to. For us, we wanted to personalise the tooth box and that is exactly what we did for this week's Creativity 521. 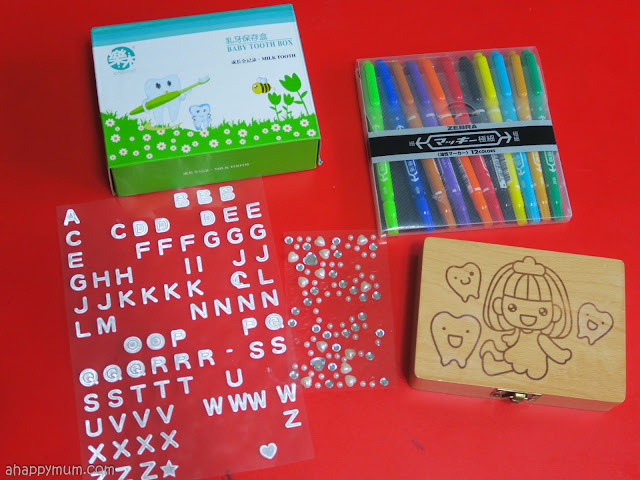 Actually, we tried using paint initially but because the drawing was too small, Angel had difficulty doing it and thus we switched to using magic ink instead. She had total freedom in choosing the colours for the girl in the middle and I was surprised that she gave her multi-coloured hair and made her a patterned dress too. In fact, she even coloured half of her hands and said "Do you know what I cannot colour her whole arm? She is wearing gloves." 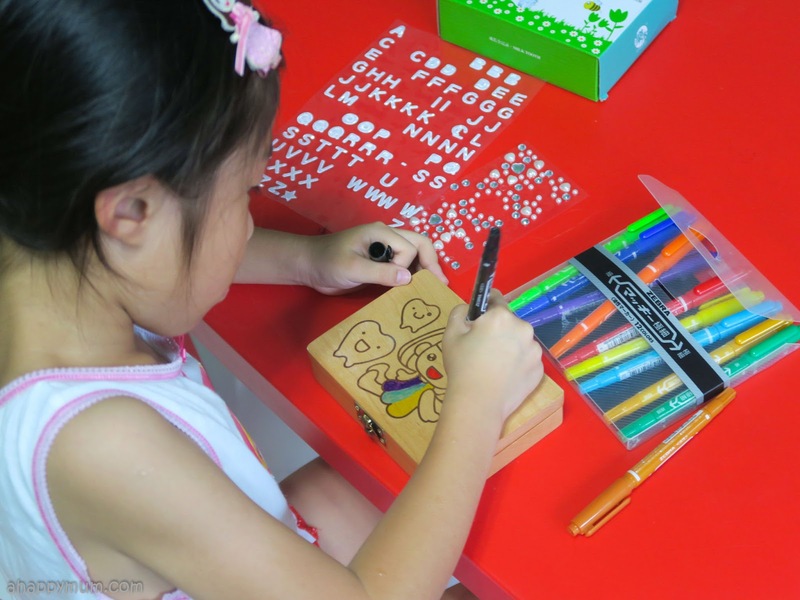 Next, she made the box her own by personalising it with her name using the alphabet stickers. Good thing that her names isn't too long or we would have run out of space! I helped her out with the white paint marker for the teeth as it was a little hard to press down the tip for the paint to flow. She then added some gem stickers for the finishing touch. As a surprise for her, I printed out her photo and added in a short profile too. She was so ecstatic when she saw it and couldn't stop beaming. Awwww, how I love that sweet photo of her that we took in Tulipmania at Gardens by the Bay! 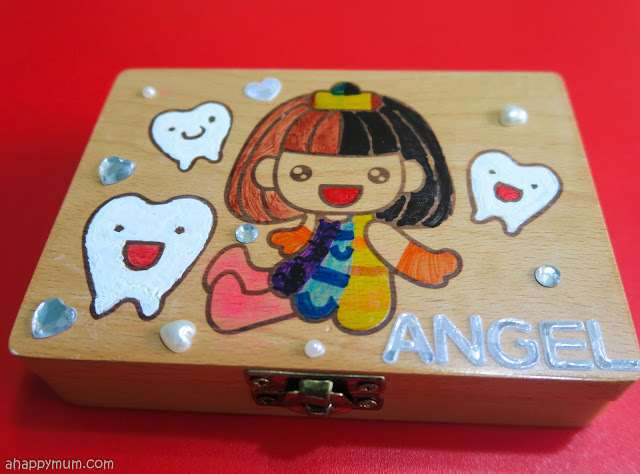 So, I guess we are now ready for more visits from the Tooth Fairy and I'm glad she has a nice personalised Tooth Box to keep all her milk teeth. Hooray! This post is entirely new for me. The topic which you chosen to write is exactly good. I also wish to create my own blog or website to share the ideas with others. But I am not confident with my write up. So still I have no such medium.